In search of a small travel trailer that you can easily take along to all of you favorite places? Try the new Forest River RV Rockwood GeoPro travel trailer for sale for your next adventure! With the many options and floorplans available you can customize this trailer to suit your camping needs. Let’s take a look at the Rockwood GeoPro review! The GeoPro has it all in one neat package! 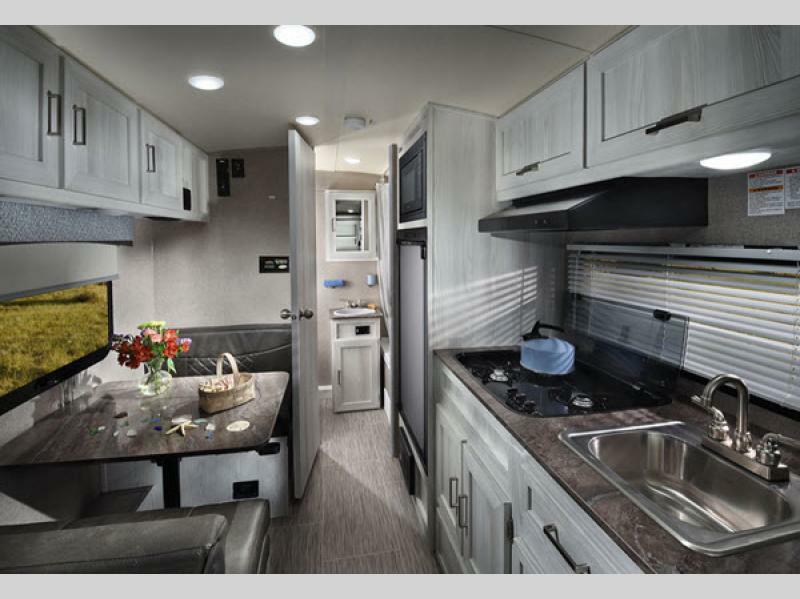 While there are numerous floorplans to choose from, let’s take a quick peak at the Rockwood GeoPro 19QB. There is plenty of room to take a couple friends on a trip or just your special someone. When you walk in, there is a full size bath to the left. The bath comes complete with a corner shower, toilet, sink with vanity and a linen closet for extra storage. There is a single slide with a everything you need from a kitchen area including a three burner stove, sink, fridge, and some storage. (Don’t overlook the outdoor grill for some yummy barbecue!) There is a comfy queen size bed for a great nights sleep after your days adventuring with plenty of overhead storage for all of your things. Everything you need for great meals on the road! 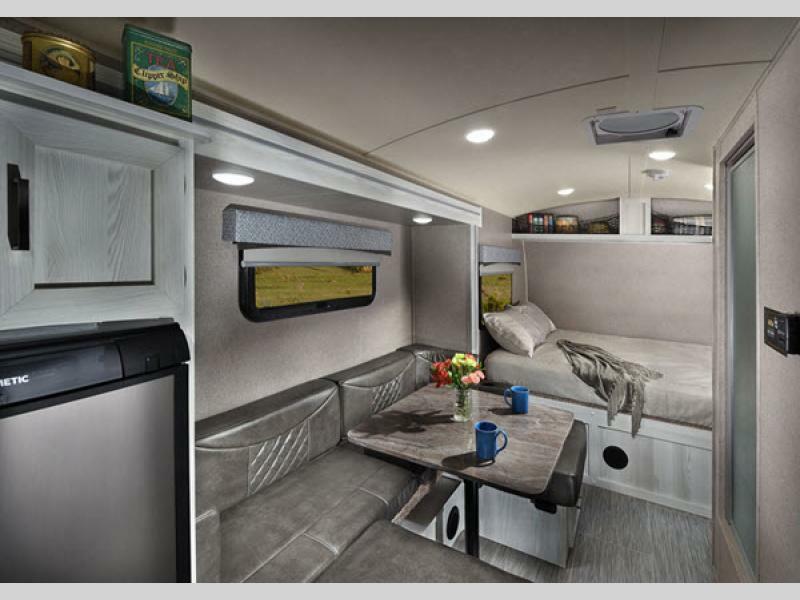 Not only is this camper fun on the inside, but the outside is a great place to hang out. Aside from the great outdoor grill we mentioned previously, a 13′ electric awning will protect you from any inclement weather as you prepare dinner, and you will find it easy to grab extra lawn chairs for any unexpected guests from the exterior storage compartment. There is also a handy outdoor speaker with Bluetooth and USB so you can jam to your favorite tunes. And if the weather is not cooperating, how about a nice movie night with the tv and dvd player that comes in each model. A movie night while tucked in this cozy bed makes a rainy day perfect. 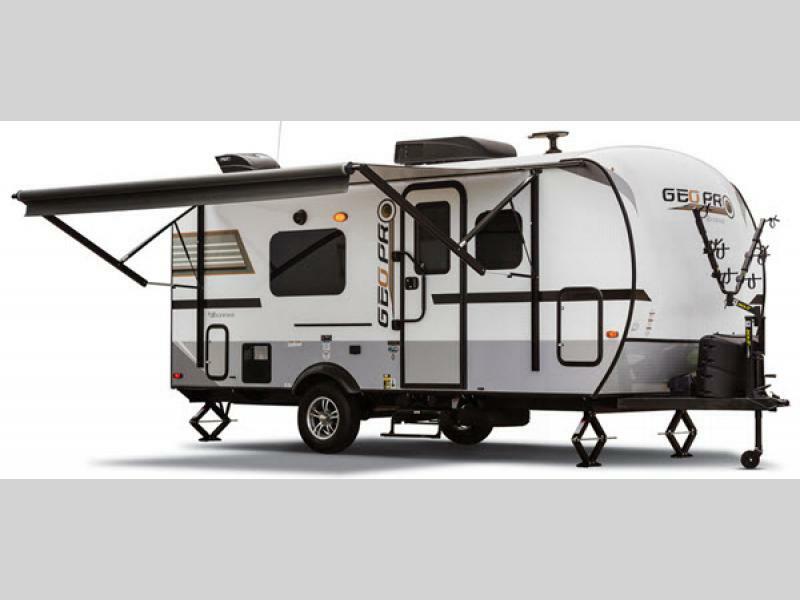 Convenience is the key to enjoying the Rockwood GeoPro travel trailer. Each model/floorplan can be towed easily by most “crossover” vehicles. Fun extras like the WIFI Ranger WIFI Booster to boost your WIFI and give you a secure connection wherever you land. All the modern conveniences wrapped up in one great camping package. It’s time to check out the Forest River RV Rockwood GeoPro travel trailer in person! Head on over for a grand tour or contact us with questions. We are happy to help in any way we can to get you on the road and enjoying your first of many great camping adventures. Looking forward to seeing you soon!